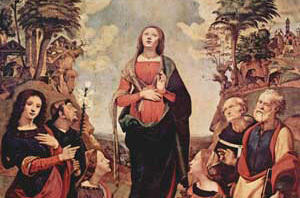 In Spain the Immaculate Conception is a feast that focuses on that Virgin Mary was conceived without sin. It always occurs December 8th. Most Christians go to church or mass for spiritual guidance and then go home to have a feast. This is a public holiday in Spain, so most get the day off. Popular celebration of this holiday dates back to the 8th century then Pope Pius IX proclaimed it to be an essential belief on December 8, 1854. From that point on Mary was believed to be born free of sin and therefore chosen by God to give birth to Jesus.